Five Star Fish Processing Services, a trusted friend of the fishing fleet for decades! 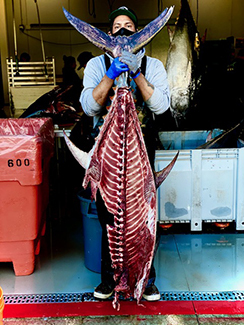 Five Star Fish Processing Services was founded in 2003, and is the premier sport fishing processor in San Diego. We provide our services to San Diego's ENTIRE Sportfishing fleet and Private Boaters too. We meet every long range boat at the dock when the trip returns. If you are fishing the local fleet on a 1/2 to 3 day trip please call us to make a reservation for processing BEFORE you depart. If we are on the dock you are welcome to walk up and drop off your fish for processing or you may drop off your fish at our shop during our normal business hours from 10 am to 2 pm June to November and from 7 pm to 10 pm July to October. We are conveniently located just a few blocks from the freeway entrance when you are leaving Point Loma. 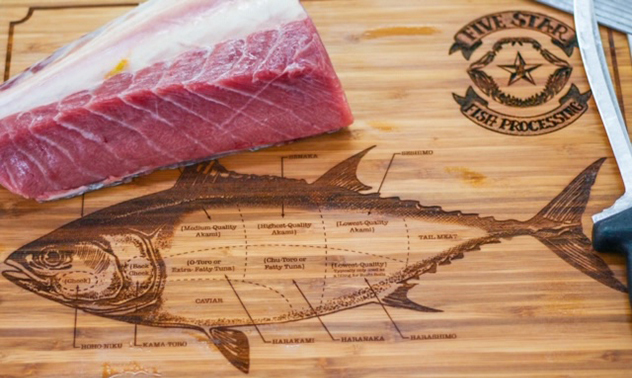 At Five Star Fish Processing we provide a number of different options for you catch; fillet and vacuum pack, smoke and vacuum pack, jerky and vacuum pack and tuna burgers. Please be aware that our office hours of operation change seasonally and during the winter months we are "by appointment only". During the summer we are open seven days a week.